Whether it's for general use for your office, or for professional print and copy services, we have the right pouch laminator for you. We can help you choose the best laminator to suit your needs. We can advise you on the pouch laminators with all the features you need to get the job done right. All our products are carefully chosen from manufacturers with a proven track record for quality and reliability. Part of our service is helping you with ongoing product support and consumables for as long as you need it. We keep our pouch laminators competitively priced as well as providing expert advice and support. It's all part of the service. Our range of commercial pouch laminators includes adjustable speed and temperature settings to ensure the best results with a variety of print and laminating media, ideal for print and copy service providers. Our office and small business pouch laminators provide reliable usability for your day-to-day laminating needs, ideal for internal business use. Get in touch for expert advice on your pouch laminator. Our team is always happy to help. What is your laminator going to be used for? 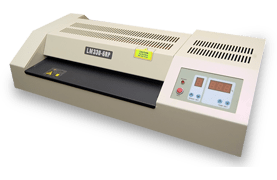 If you need a laminator as part of providing professional print and copy services, then you will need a commercial grade pouch laminator. 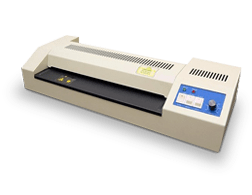 For general office and use and small business signage and display, an office grade pouch laminator will likely do everything you need for your purposes. What is the size and thickness you need to laminate? We have pouch laminators to suit maximum A3 or A2 sized prints as well as different thicknesses of the laminating film. Thicker laminating film will require higher temperatures and speed control settings available with commercial grade pouch laminators. How much volume do you need to produce? If your business needs to produce a high volume of laminated prints for in-house use, such as menus, price lists, signs, and instructions, then a commercial grade laminator may fit your needs better. 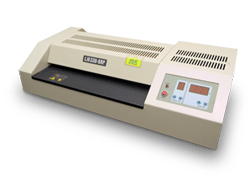 If you only need to laminated prints occasionally, then general purpose office laminator should do everything you need it to do. "Tyson and his team are ace! I needed to purchase product we hadn't used before and not only did they deliver extremely fast but the stock was a really good price! Tyson knows his products, is happy to source whatever you need and above all he is quick to get back to you with samples and prices. Great service!"